Cute! 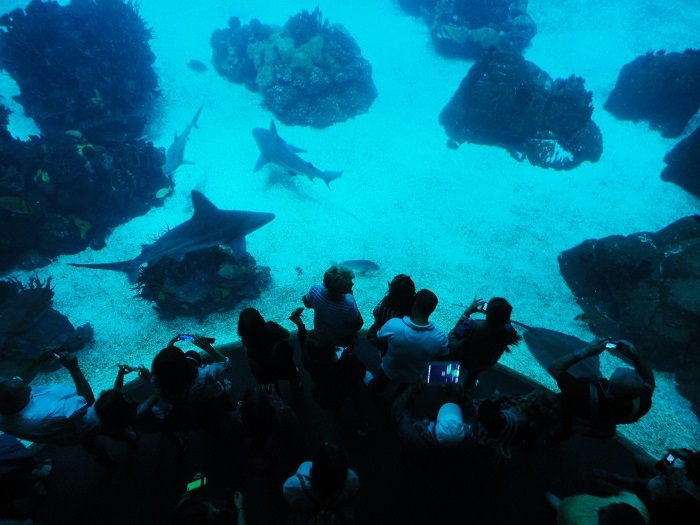 Everyone is busy photographing the sharks! At least they stopped texting and talking on the devices long enough to use them for a good purpose. We've become a world where people have quit talking to each other and who frequently don't even see what's around us because our eyes are glued to a piece of technology. You have a real talent for finding a perspective to take your photos! Nicely done! It's weird to think that just a few years ago, almost all of these people would be holding regular cameras! What a great shot for the day, Jose, as always!! Wishing you a wonderful weekend!! Enjoy! Yes! Please keep them on that side of the glass. Everyone has technology these days! What a great shot. They all look like they are underwater with the sharks! Such an excellent image, Jose! The sharks are great, the people are great, but it's the juxtaposition of the two that really make this special. I like it! Wonderful observation. This is so common now. I wonder who will look at the photos a couple of weeks from now.